Shop Elasta QP Olive Oil Mango Butter Conditioner (15 oz. )15 oz. $599$5 and 99 cents$0.40 / oz. 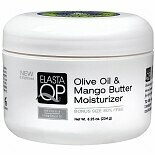 Shop Elasta QP Olive Oil & Mango Butter Hair Moisturizer (8.25 oz. )8.25 oz. $499$4 and 99 cents$0.60 / oz. 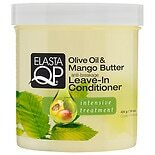 Shop Elasta QP Olive Oil Mango Butter Curl Creme Pudding (15 oz. )15 oz.